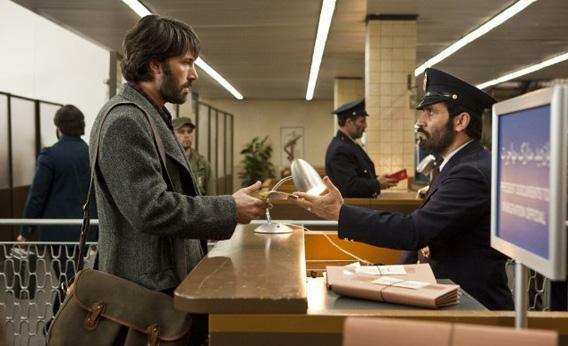 Argo reviewed: Director Ben Affleck’s Iran hostage crisis drama is his best film yet. Director Ben Affleck’s Iran hostage crisis thriller is his best movie yet. Still by Claire Folger/Warner Bros. Entertainment © 2012. In his third movie, Argo (Warner Bros.), actor-director Ben Affleck pulls off a nifty trick. He takes a little-known but incredible true-life story—the clandestine CIA rescue of six stranded Americans during the 1979-81 Iran hostage crisis—and turns it into a rip-roaring Hollywood thriller, complete with romance, a comic subplot, and a car chase or two. Argo isn’t quite on the level of the Sidney Lumet classics to which Affleck pays stylistic homage—smart and taut as it is, it lacks the broader political vision of a film like Dog Day Afternoon. But Lumet lite still goes down pretty smooth. The events Argo recounts took place a few months after demonstrators laid siege to the U.S. Embassy in Tehran, taking 52 diplomatic employees prisoner for what would turn out to be well over a year. Argo sets up this takeover with an opening montage that cleverly deploys old news footage, storyboard panels, and voice-over to fill in the complex back story—it goes all the way back to 1953, when the United States and Britain backed the coup that installed an authoritarian Shah. After the Shah fled Iran during the Islamic revolution, eventually seeking medical treatment in the United States, Jimmy Carter refused to extradite him to his home country to stand trial. It’s on an image of the resulting chaos—an image re-created almost verbatim from news photographs of the time—that the movie proper begins: an angry mob just beginning to scale the walls of the embassy compound. Inside, terrified workers shred documents and destroy sensitive materials, knowing it’s only a matter of time till they’re captured or worse. (These early scenes’ unintended resonance with the recent attack on the diplomatic mission in Libya makes the sitting-duck tension even harder to tolerate.) In the tumult following the attack, it’s at first hard to follow just which hostages have been spirited where. But soon enough Bryan Cranston, playing a CIA bigwig, appears to explain it all to us (and to the ill-equipped State Department staff): As the embassy siege began, six foreign-service workers escaped out the back door and managed to make it to the residence of the Canadian ambassador (Victor Garber), where for months they’ve been holed-up indoors. Each proposed plan to extract the group sounds lamer than the last, from sending a military team on a 300-mile bicycle trip across Iran’s closed borders, to passing off a group of spies as visiting English teachers. (This in a country where all English schools have just been shuttered.) Finally, CIA “exfiltration” expert Tony Mendez (Affleck), after catching a few minutes of a Planet of the Apes movie on TV, contrives what Cranston grudgingly admits is “the best bad idea we’ve got”: What if the six houseguests pose as a Canadian film crew who’ve traveled to Iran to location-scout for a Star Wars-style space epic? If someone could manage to supply them with fake Canadian passports, couldn’t they simply head to the airport and fly out? As one skeptic derisively observes, Mendez’s plan comes from the long-standing “so crazy it just might work” school of problem-solving. The second 20 or so minutes of the film amusingly track the process by which Mendez scrambles to establish the plan’s credibility. He enlists his buddy, a Hollywood makeup man (John Goodman at his most endearing) along with a washed-up movie producer (Alan Arkin at his most mordantly hilarious) to option an existing script and set up a fake production office, even going so far as to take out an ad in the trades for their upcoming production, Argo. (Tagline: “A Cosmic Conflagration.”) A scene in which Arkin’s character expertly strong-arms a competing producer (Richard Kind) into giving up the rights to the Argo script is a deliciously effective, and affectionate, piece of Hollywood satire. There’s a nicely executed transition from this comic interlude to the ratcheted-up tension of the film’s second half. After negotiating a maze of bureaucracy on both the D.C. and Tehran fronts, Mendez makes it to Iran, where he grills the freaked-out houseguests on the contents of their fake résumés as the Iranians steadily close in on their whereabouts. Even if you go in knowing the details of how the operation turned out (I didn’t, precisely), you can’t help but break into a cold sweat during the climactic checkpoint encounter, or thrill to the car-on-plane chase down the runways of Tehran’s Mehrabad Airport—one of a few scenes in which screenwriter Chris Terrio’s broadly accurate retelling of real events allows itself some fairly whopping dramatic license. But Argo provides just enough grit to sand down the edges of the audience’s disbelief. We’re not here for an episode of Frontline: We’d like a little emotional catharsis with our late-20th-century history lesson, and Affleck generously provides it in the movie’s last act, when Mendez’s character and the resilience of the houseguests are put to the test. One could wish that the movie contained at least one significant Iranian character—the locals we encounter are pretty much restricted to the “menacing thug” or “loyal servant” variety—but there’s no pandering to negative stereotypes of Islam, and the opening voice-over treats the history of American meddling in Middle Eastern affairs with frank disdain. Argo is a rollicking yarn, easily the most cohesive and technically accomplished of Affleck’s three films so far, but a part of me wishes the director hadn’t cast himself in the lead role. It’s not that he’s terrible as Agent Mendez—we believe in his intelligence and commitment to his task, and he even gets off some dryly funny punch lines. But the character remains something of an emotional cipher, and not in a mysterious way, just in a dull one. An older, less callow actor—George Clooney, Brad Pitt, or (to get crazy and cast an actual Latino) Benicio Del Toro—might have brought more texture and darkness to the role of this quiet, driven man, a work-obsessed loner who’s “taking a break” from his wife and young son. The night before Mendez and the houseguests make their big break for the airport, Affleck gives us a dusk-to-dawn montage of Mendez alone in his hotel room, smoking cigarettes and drinking whiskey as he wrestles with whether or not to go through with the plan. With the right actor, this wordless interlude could have made for a powerful existential mini-drama: the dark night of the CIA-agent soul. Instead, it just sort of felt like watching Ben Affleck get hammered.